Rest Assured you will receive a top quality snaffle bit delivered straight to your door. Your number one online source for Horse Tack Supplies sold at unbeatable prices. 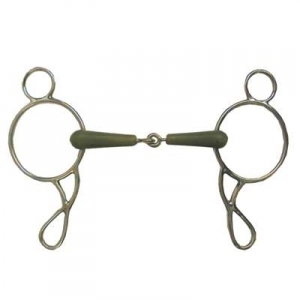 The Flexi Wonder Gag Snaffle Bit that we offer is a Top Quality item for your Horse. This item is made of Flexi material that reduces the pressure of the bit. The size of this item is 3'' rings and 20mm mouth. If you are in need of Flexi Snaffle Bits we have just what you need. This is one of the best selling bits offered here at our online Equine Store.